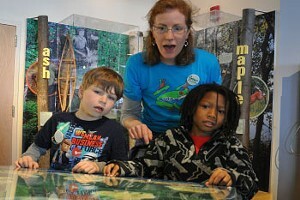 Habitat: Camper-Style Playhouse | Habitat | Kids VT - small people, big ideas! Catherine Drake and Rich Levine were itching for a project last mud season. The Stowe couple spend a lot of time with their two granddaughters — 4-year-old Nora and 2-year-old Claire — who also live in Stowe. They decided to build them a playhouse. 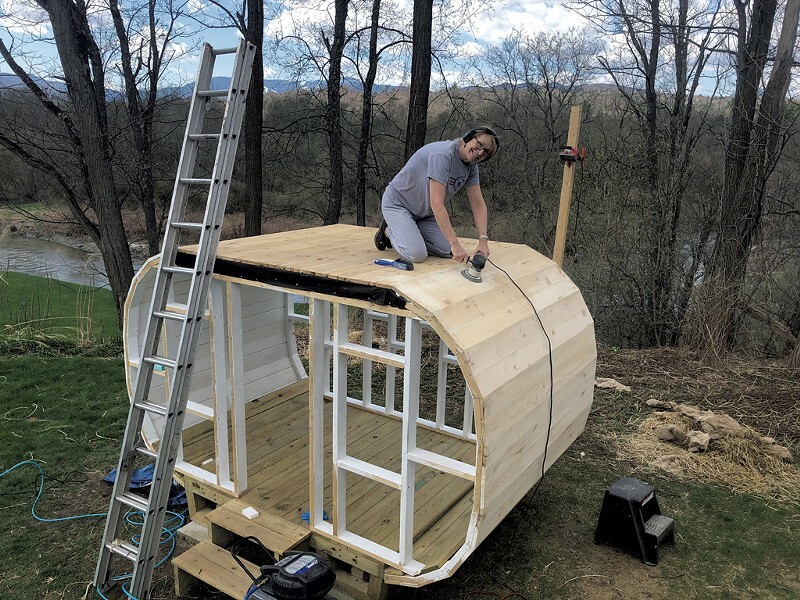 Drake and Levine weren't newbies to tiny-house building. Years ago, when their own two daughters were growing up, Drake and Levine built a treehouse for them in their New Jersey backyard. It wrapped around a tree that was about 500 feet away from their actual house, and even had a working intercom. "It was impressive," Drake said. "Oh yeah," recalled their older daughter, Julia Rogers, mom of Nora and Claire. "We could call into the main house." The camper-style playhouse Drake and Levine made for their grandchildren lacks that particular amenity. But, Rogers said, "this one is way more stylish." It is painted swimming-pool blue and white and has a window — with a screen — on each side of a Dutch door. It sits on four wheels and can be hitched up to a truck and moved if necessary. A rooftop porch sports two mini Adirondack chairs (decorative for now, since the roof railing is low and the girls are still young). 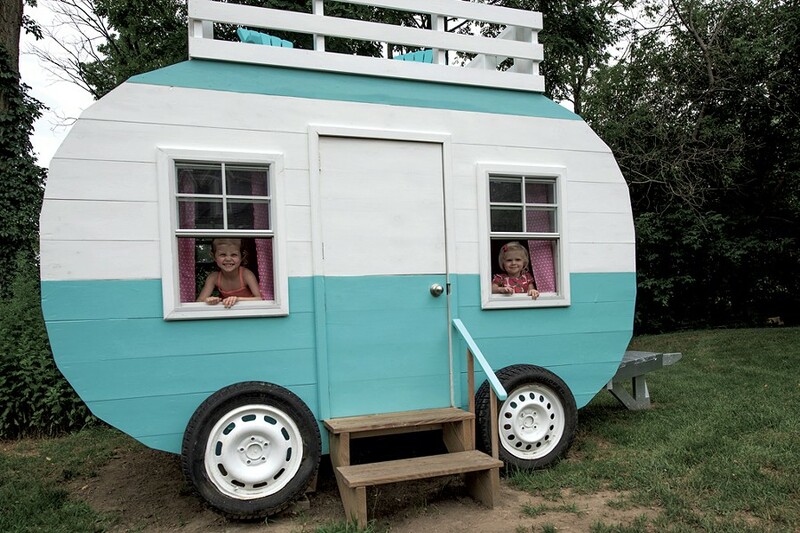 Drake and Levine chose the camper design because they wanted to "inspire the girls to use their imaginations to go places and dream up play scenarios of traveling," said Drake. Nora and Claire come from a family of avid travelers. Their mom works as a gap-year consultant, advising recent high school grads on where to go and what to do before they start college. Before she and her husband, Tom, got married, they took a year-long trip around the world. Last fall, the family spent a month in Hawaii; the girls have been pretend packing for exotic trips ever since. At first, Drake and Levine wanted to buy a vintage trailer and refurbish it as a playhouse. But they couldn't find anything that fit the bill. So they began looking online for building plans, and found them at Paul's Playhouses. "We ordered the plans, which served as a general blueprint for the structure," said Drake, "but we modified it significantly." 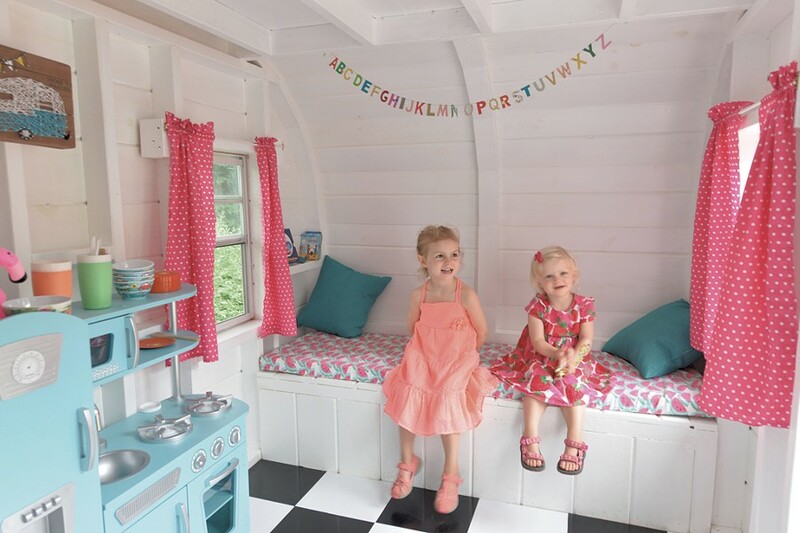 Their modifications included custom-cut wooden boards to make the playhouse watertight, added height, a functioning door and real tires. 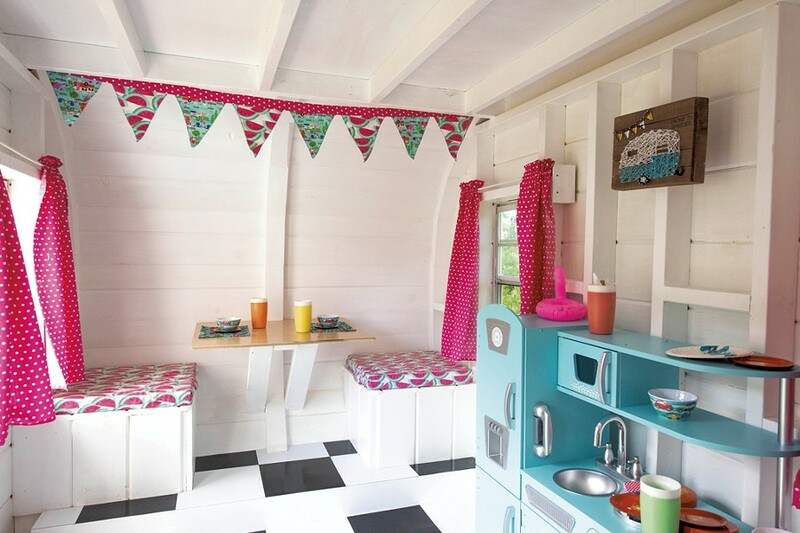 They came up with the impeccable interior design themselves: white walls, a black-and-white checkered floor, pink polka-dot curtains, and playful watermelon upholstery on the dinette seats and couch. 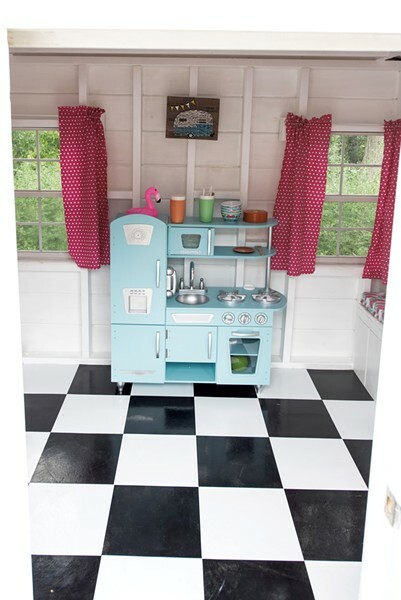 The pièce de résistance is a candy blue, vintage-style play kitchen. Drake and Levine said they spent "hundreds of hours" on the project. They began in their garage in April, when there was still snow on the ground. Levine did the construction; Drake served as project manager and did the sanding, painting and interior decorating. They kept the playhouse under wraps, even as their daughter and granddaughters visited regularly. 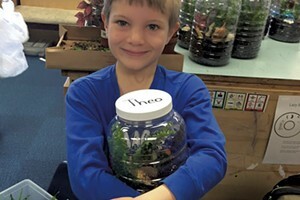 "I would not let them go in the backyard," Drake said. It was finished in time for Claire's second birthday, in June. When the girls stepped inside for the first time, "they were pretty excited," recalled Drake. "They were psyched about the colorfulness." Drake estimates they spent about $1,500 on materials. "We got carried away," she admitted. "The girls would have been happy with anything, but I kept coming up with things." When Nora and Claire are older, their grandparents may install a ladder to allow them access to the roof porch. And Levine just hooked up electricity to the playhouse. "One light on the outside, one light on the inside," said Drake. "No cable TV."